The Program Manager is a centralized tool to manage submissions and subsequent review processes. Review Portals require that a process first is setup within the Program Manager. The Program Manager is also used for assigning reviewers to specific submissions for feedback (See: Assignments). From the Workspace Settings (not from the Navigation Bar), select Program Manager. Click on the green Create a Program button. From here, you will name your program - for example, Zen Foundation Grant Application - and designate the form which stores you main submissions - typically the submission or application form. 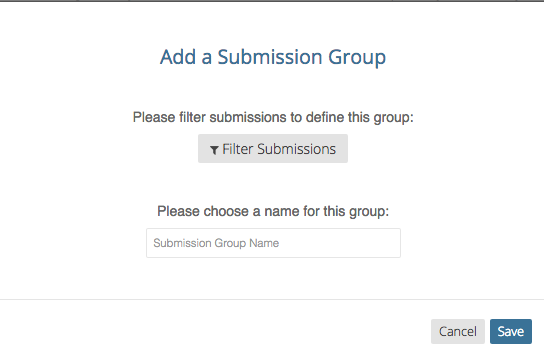 Once your form is selected, you can designate submission groups, which can be used to group together applications with similar characteristics. They can be used if you want to assign applications for review by group rather than individually. For instance, you could create a group for Florida applications and another for Georgia applications if you are going to have different people review each group. Creating Submission Groups is optional and by default we create an “All Submissions” group in case you don’t need to use them or are not planning on using assignments. If you would like to set Submission Groups, please see the next section. Otherwise, click "Save Program." Warning: Once you save the program, you may not change the Submission Form. If you need to make a change, you will need to delete the program and start again. To create a submission group, click the green "Add Submission Group" button. Click "Filter Submissions" to choose a filter definition for this filter group. 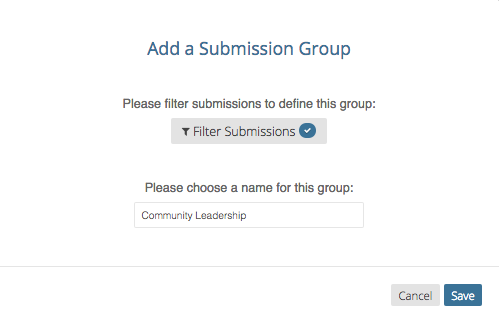 Note: You cannot use summary fields as the filter definition for a submission group. Note that the Filter Submissions button will show a checkbox to indicate that a filter has been defined. Name the Submission Group. Click "Save." If you need to delete a Submission Group, select that group from the Submission Groups listing. You will then see on the bottom a red 'Delete Submission Group' option. A Program consists of one or more Processes. A Process is typically either a review round associated with a specific review form and a group of reviewers, or a viewing round that uses a Portal. Tip: Processes have many settings that rely on forms being previously setup with the proper criteria. If you are not starting with a template, we recommend reading through these instructions first to ensure that your forms are setup properly. In order to add a Process to your new Program, go to the homepage of Program Manager to see all of your existing Programs. Below the Programs you will see a +Create a Process widget. Click this. The first part of your Process involves naming it and setting up Submission Groups & Stages. A Process can be optionally limited by both a Submission Group as well as a Stage. 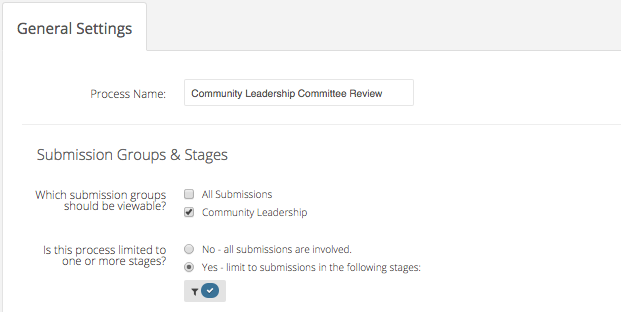 In the following example, we limit this process to just those submissions that meet the filter definition for the "Community Leadership" submission group. We then further limit this process to just those submissions that have reached the "Committee Review" stage. In this example, it, therefore, omits any submissions still in draft mode that have not been submitted, complete submissions that have not yet passed an internal review stage, and submissions that have already been awarded or declined. Click "Save" to return to the Process settings. Note again that the filter button shows a checkbox to indicate the stage limit has been defined. The next part of setting up your Process involves adjusting Permissions. Permissions indicate whether this process is public or private. Public processes allow an administrator to publish a portal where anyone can view the submissions without a password. This option is chosen by indicating "Anyone." Private processes are limited to just those users setup in the Portal Users form at the Program Level. This option is chosen by indicating that "Only a specific set of portal members." Selecting this option will bring up additional settings. You should select the form that stores this specific set of members. Administrators can further choose whether members can view all previously configured submissions, or only those individually assigned to them. The final part of setting up your Process is customizing Feedback. A linked field that connects to the form that stores Submissions. 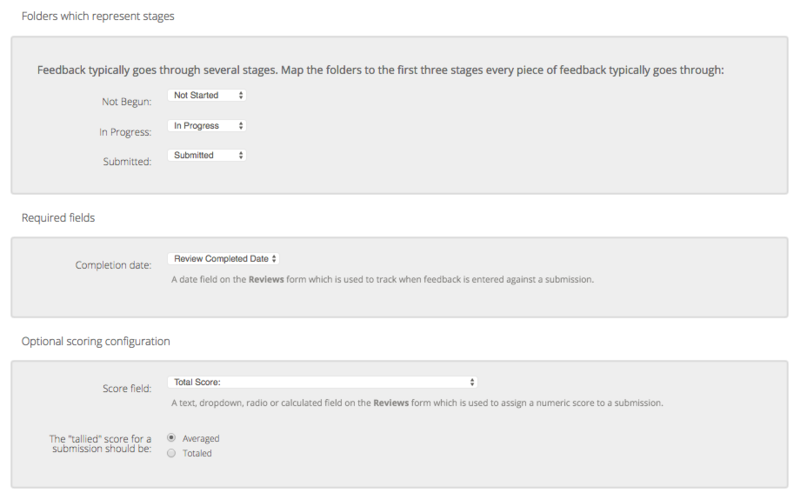 The feedback form can also optionally include a score field, and scoring type (average or total). Click "Save Process". You are then ready to create a Review Portal for this process. Creating a Review Portal. If you are utilizing the Program Manager to manage Assignments, you must access this from the navigation bar versus from Workspace Settings. Creating Assignments.